As I have said many times, anti-Zionism (i.e., systematic bias and hostility against Israel & Israelis, often escalating into obsessive hatred and demonization, sometimes accompanied by conspiracy theories about real or alleged "Zionists") is not always or necessarily the same thing as anti-semitism. Sometimes it is, sometimes it isn't, but much of the time that whole question is a distraction. The key point is that anti-Zionism in this sense--which, again, doesn't mean criticism of Israel and Israeli policies, but demonization of Israel--is morally reprehensible and politically pernicious in itself, whether or not it is caused by (or a coded euphemism for) anti-semitism. At the same time, it's also true that hysterical anti-Zionism can help push people over the line into outright anti-semitism, or at least help make it seem more acceptable, respectable, or "understandable". Ben Cohen at Z-Word analyzes a recent example of this phenomenon, generated not by some fringe whacko blogging from a basement but by a British Labour Party MP. As Cohen correctly explains, part of what makes this example interesting and illuminating is precisely the fact that it's not startling or unusual, but increasingly ordinary. This article includes a guest contribution by habibi from Harry’s Place. A group of friends in London alerted me to this grubby little piece by a British Labour Party Member of Parliament, Bob Marshall-Andrews, concerning his recent visit to Gaza. Upon reading it, I was struck by various thoughts, not least the degree to which Marshall-Andrews words will be welcomed by the Hamas cheerleaders who compose the Palestinian solidarity movement [in Britain], in marked contrast to the fierce condemnation with which this blog, and others like it, will greet his compendium of antisemitism-laced falsehoods. Why bother to refute such lies, one might ask, when those of us who defend Israel are at irreconcilable odds with those who demonize her, when any charge of antisemitism we make is bound to be dismissed as another tired attempt to muzzle debate? The most satisfactory answer I can come up with is that some things - and Marshall-Andrews article is one of them - are so odious that they cannot pass without rebuke. 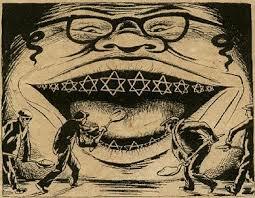 But of course, he’s not antisemitic. That’s just a device to smear supporters of the Palestinians. Then he goes on to talk about the devastation visited upon Gaza. He describes a scene of apocalypse, in which a population living in the shadows of bombed sewage plants, cowed by chronic shortages of basic foodstuffs, somehow survives. Still, Marshall-Andrews can’t resist telling us that, amidst all this horror, his Hamas hosts provided him and his colleagues with a “generous lunch.” Continuing on the gastronomic theme, he then tells us that breakfast the next day consisted of boiled eggs and cheese, “because of the blockade.” Actually, that’s pretty standard fare at most hotel buffet tables, and a much healthier start to the day than that enjoyed by large numbers of inner-city kids who don’t live in war zones. In fact, this is a shameful, bare-faced lie. Those tempted to believe it should question the credentials of a man who, a few paragraphs earlier, confesses that he has “little experience of extensive war damage in civilian areas.” Then again, reality is incidental to all this: the Israel-hatred swamps Marshall-Andrews judgment, just as it did with London Times hack Janine di Giovanni, who ludicrously claimed, in the wake of the Battle of Jenin in 2002, “[R]arely, in more than a decade of war reporting from Bosnia, Chechnya, Sierra Leone, Kosovo, have I seen such deliberate destruction, such disrespect for human life.” There was, by the way, no massacre in Jenin. One fact which Marshall-Andrews does get right - though no doubt he’d inflate the figure if he could get away with it - is that 1,400 died during Operation Cast Lead (he omits to mention that at least 60 per cent of those were bearing arms on behalf of Hamas.) Worse than Sudan - or “the Sudan” as he calls it, with touching colonial nostalgia? In Darfur, 300,000 died, either through violence or diseases caused by the displacement which drove 2.7 million people from their homes. Worse than Congo? According to an International Rescue Committee report, that conflict may have claimed a staggering 5.4 million lives; there are other, more cautious estimates, but even these do not dip below 2 million. Worse than Burma? After Cyclone Nargis killed 140,000 people in 2008, the 3.4 million survivors were deliberately blocked from receiving aid by the Burmese junta, which went so far as to arrest ordinary Burmese civilians who attempted to bring relief to the stricken area. On this last point, it’s worth remembering that repressive regimes, whether prosecuting war or minimizing public scrutiny of their responses to humanitarian disasters, want to make their targets suffer more, not less. They want the victims to be hungry and scared, unable to predict when the next aid convoy might arrive. In their siege of Sarajevo, the Bosnian Serb militias perfected this into a grotesque art form. Life in Gaza, to the contrary, has - by comparison to these other situations - an enviable predictability. No, I’m not denying that Gaza needs humanitarian aid. I am saying that Gazans can be sure that the aid will arrive, just as it did over this last week, when 13,919 tons of aid rolled in. Close to 1.4 million liters diesel fuel and 832 tons of cooking oil crossed in as well, courtesy of the same state which Bob Marshall-Andrews obscenely accuses of carrying out a genocide in Gaza. True, those figures come from the IDF. If they are massaged numbers or outright fabrications, then those who believe so should say so - and come up with credible evidence to counter them. I am confident - given the parallel universe inhabited by people like Bob Marshall-Andrews, in which the degree to which a statement is true depends on how intensely the person issuing it hates Israel - that they will not be able to do so. Bob Marshall-Andrews is Labour MP for Medway. Last week he attended a meeting of the Palestinian Return Centre (PRC) and the self-styled Labour Friends of Palestine and the Middle East at Westminster. The PRC are the Hamas supporters who invited Hungarian neo-fascist Krisztina Morvai to one of their London meetings last year. Sameh Habeeb, the hate publisher who runs the Palestine Telegraph, was one of the organisers of that meeting and this Westminster event too. The Labour group lists the Palestine Telegraph under a “The best coverage of Palestine and the Middle East” heading on its website. Habeeb’s blog is also “recommended”. What happened in the March 2010 Iraqi elections? What were the March 2010 Iraqi elections about?